This is a picture of the street fair on Broadway, today, May 12, 2018. I do not know if there’s a steak vendor. The Articles of Confederation and Perpetual Union was the first constitution of the United States. It was drafted by the Second Continental Congress from mid-1776 through late 1777, and ratification by all 13 states was completed by early 1781. 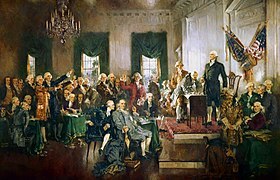 Under the Articles of Confederation, the central government’s power was quite limited. The Confederation Congress could make decisions, but lacked enforcement powers. Implementation of most decisions, including modifications to the Articles, required unanimous approval of all thirteen state legislatures.